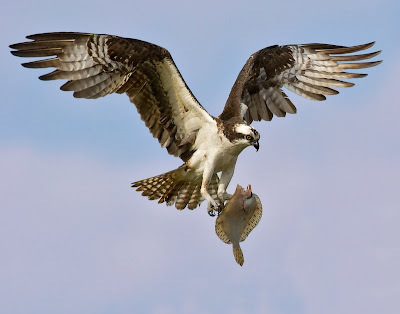 My photograph of this Osprey with a flounder, taken in Connecticut, won Best in Show at the Glennies! I knew that the chicks were hungry and could see the male fishing but when he started flying into the nest with this big round "disc"in his talons it took me a moment to figure out that it was a flounder. Getting it back home and inter the computer I could see that the flounder's mouth is open too!